Jazz up lunch with this radish, avocado and egg mayonnaise sandwich. I currently have a small addiction to the series Sleepy Hollow. Actually, I have a rather large addiction. But hey, my blog, my way. So small addiction it is. The sort of addiction that when lunchtime rolls round, I want to spend less time cooking and as much time as possible hanging out and immersing myself in all things Sleepy Hollow. It has got nothing whatsoever to do with a particularly dashing leading character. Of course not. Drooling over Tom Mison? Nope, it is all about those dastardly demons waiting to be defeated week after week after week. Lunch needs to be easy so more time spent ‘erm erm’ watching the baddies be defeated. Which is why I jazzed up my standard egg mayo sandwich by adding in creamy avocado, crunchy radishes and spring onions and herby coriander. And the best thing is that you can boil the eggs ahead of time so when it comes to making your sandwich, it takes all of 5 mins to do. Yeap, this really is that ultimate sandwich recipe. 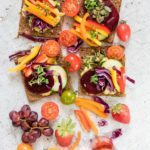 If you want more sandwich ideas why not make this lovely vegan tuna sandwich from Veggie Desserts? In the mean time I leave you with my radish, avocado and egg mayo sandwich. 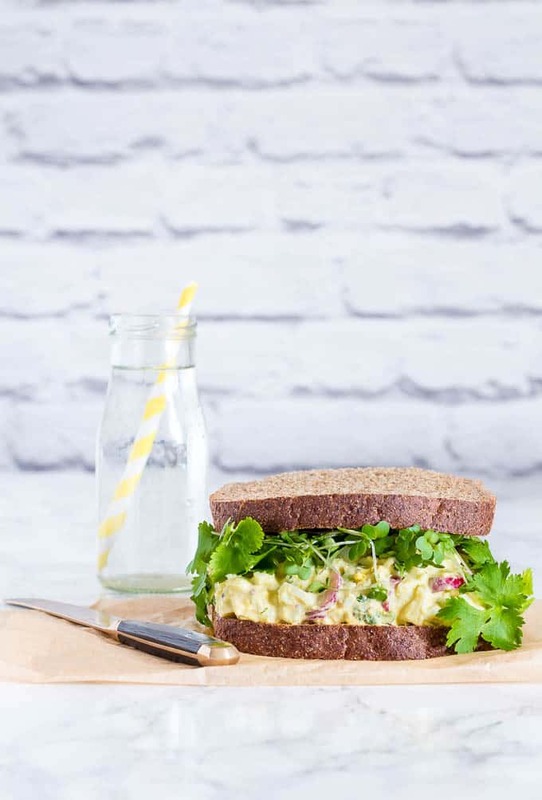 Don't forget to tag #recipesfromapantry on Instagram or Twitter if you try Radish, Avocado and Egg Mayonnaise Sandwich! It is really, really awesome for me when you make one of my recipes and I'd love to see it. You can also share it on my Facebook page. Please pin this recipe to Pinterest too! Thank you for reading Recipes from a Pantry. Peel the eggs, roughly chop them and set aside. In a large bowl, mix together the yoghurt, mayonnaise, mustard and salt till well combined. Add in the chopped eggs, avocado, spring onions, radishes, pumpkin seeds and coriander and mix till combined. Adjust seasoning. 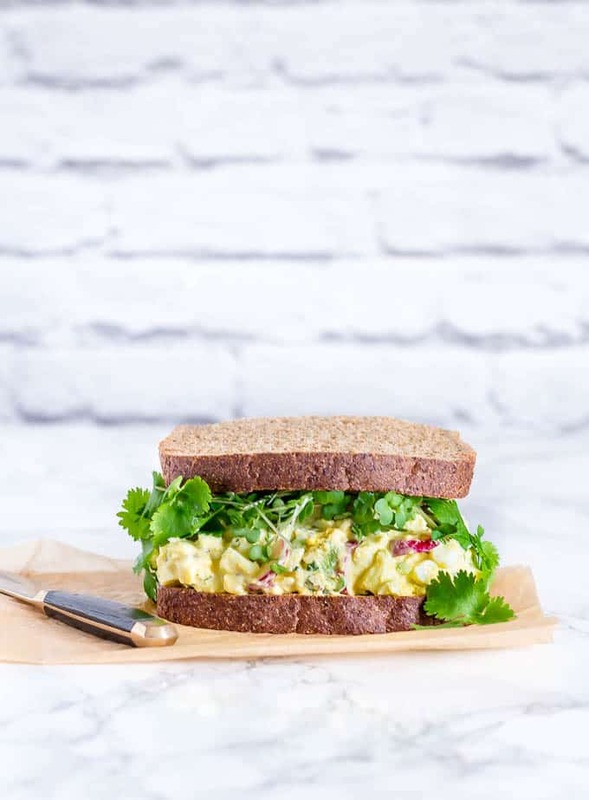 Assemble your sandwiches by spreading the egg mayonnaise mix on one bread slice, top with microgreens and then cover with another bread slice. This looks lovely – I don’t normally eat sandwiches but this has really made me want one! This looks lovely and exactly the way I want my sandwich to be – full of filling! Yeap you need the filling oozing out everywhere. Oooh I’m hungry now – love this. 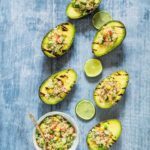 A nice combo; I didn’t used to like avocados but recently I’ve become addicted! EWow, you are the first person I know who does not like avocado. This looks so good. I love egg mayonnaise and I bet the radish gives it a wonderful extra kick. Fab! Wow, that’s a sandwich and a half Bintu, did you manage to eat it without all the filling oozing out into your lap? That would totally be me, haha. Lovely combo of fillings, and the little extras like toasted pumpkin seeds and radishes – going the extra mile with a sandwich always pays off! Totally oozes everywhere. But I love it. Great way to dress up egg salad! I love massive messy-to-eat sandwiches. Those are the best! And I think this falls right into that category. I’m really a sandwich girl because I can’t cook, but I can put a mean sandwich together 🙂 And this has all my favourite things in it. Awesome. Oooooh, I think I better go check out your sandwiches. Great call on adding the radish, I’d love this on rye for a brunch. It would have a real scandi vibe to it. Thanks Helen, I am huge radish fan so add them to everything. This sounds like my idea of a perfect sandwich, Bintu! Also, I love that you combined mayo, Greek yoghurt and mustard. Mmm… I really could eat one of these as a bedtime snack! Now that is an idea – bed time snack. Mayo sandwiches are the BEST and with all these delicious ingredients you’ve just made them simply irresistible! Never thought to use pumpkin seeds and coriander in an egg sandwich! Sounds like a delicious combination! It is your blog so if it is a small addiction then it is a small addiction! I love egg salad reminds me of growing up and the addiction of avocado is pretty wonderful. Sleepy Hollow is one of my favourite movies so I would probably love the show! And I would be so happy to have this sandwich on hand to enjoy it with! I love the use of Greek yogurt in this recipe. I’ve found that I love egg and chicken salads made with Greek yogurt. It gives the salads such a wonderful flavor. Your sandwich is lovely, Bintu. I love all of those healthy microgreens on it! This is such a perfect sandwich. Well filled and I do think a classic egg mayo is one of my all time faves but you have made it even better by adding in radishes and avocado. Heaven! This is a strange one for me as avocado is my food heaven, egg is my food hell! 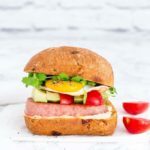 I love sandwiches…and especially when they are packed full of yumminess! Anything with avocado is a go-to for me. And I am really starting to like radishes these days…I never used to. This really looks wonderful! I’ve just been to the super market and bought some radish, this looks delicious! Think I will have this for lunch tomorrow. That’s a stinking looking sandwich Bintu – love it! I fall in and out of love with sandwiches, but I reckon this one’s a keeper! We love Sleepy Hollow too! It’s one of my favorite shows and my husband’s too! ps. totally in love with this sandwich too! 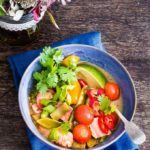 Oh my, this is my favorite kind of lunch – tasty and awesome! 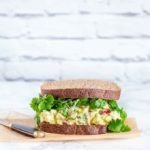 I’ve always loved egg salad sammies, and I can’t wait to try this.